Fresh, new Inspiration with added features! New Inspiration takes all the best elements of the original course and adds some exciting new characteristics perfect for motivating and challenging teenage students. The four-level course takes teenagers from beginner to intermediate level, evolving with the students, reflecting their changing needs and interests. Popular aspects such as the authentic, varied and content-rich topics have been improved and enhanced. The cultural and cross-curricular nature of these topics feature strongly throughout New Inspiration, alongside strong skills development activities and tasks. 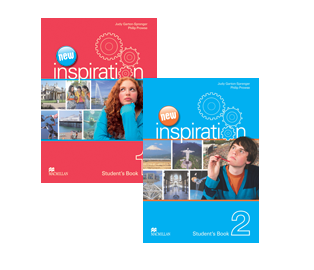 New Inspiration 3 and 4 were published in 2012. As with the original edition, New Inspiration 3 and New Inspiration 4 take a more adult approach to topics, with longer texts and mature subject matter that allows students to question the world they live in and use cross-curricular topic knowledge to challenge them. New scentific and geographical subjects will be perfect in establishing communicative activities and allow for more complex grammar practice.